Colditz - a forbidding medieval castle near Leipzig, Germany - remains one of the most potent symbols of the Second World War. Reputed to be the Nazis most escape proof prison this grim castle is the most notorious PoW camp in history with the distinction of being the only German prison that had more guards than prisoners. The castle was specifically used to impound incorrigible Allied officers who had repeatedly escaped from other camps but putting so many experienced serial escapers in one place proved to be a rather questionable idea. Despite more conventional escape routes gradually being sealed off by the Germans, members of 'The Colditz Escape Academy" continued to jump, tunnel and sneak out of this "inescapable" prison in surprising numbers. 130 prisoners escaping and 31 successfully reaching home. When captured, the result was three weeks in the solitary confinement block, however this didn't stop prisoners inventing more elaborate means of escaping, even catapulting themselves out of high windows, and of course the famous design and building of a sophisticated glider. This new edition, reproduced from a pencil drawing by Nicolas Trudgian. 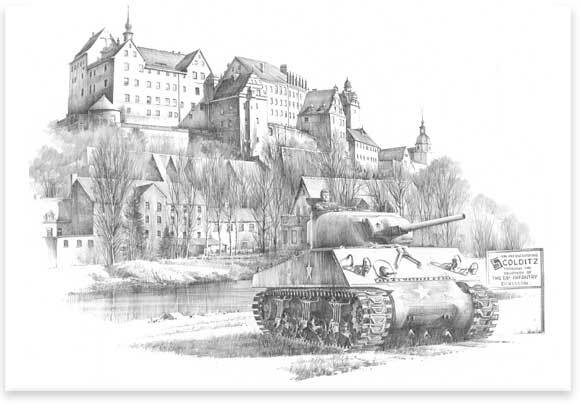 depicts the imposing castle shortly after being liberated by American troops in April 1945. In the foreground below a Sherman Tank of the 9th Armored Division stands on watch, close to the sign that was erected by the US 69th Infantry Division. With the edition personally signed by veterans that were inmates of Colditz during WWII. this extraordinary release represents an illustration of human resilience and ingenuity, and is likely to be highly sought after by collectors and historians alike. Joining the Kings Royal Rifles in 1939 he was captured in Calais when it fell to Guderians Panzers and sent to Eichstadt from where he escaped. After further attempts he was sent to Colditz in 1943 until the end of the war having spent almost five years as a PoW. He joined the Royal Ulster Rifles in 1939 hut was wounded and captured whilst with the Commando's in St Nazaire in 1942. After escaping from Spangenherg and further attempts he was moved to Colditz in June 1943, where he was involved in several escape attempts until liberated in 1945. He transferred to the RAF from the Royal Engineers in 1938 and was on Flying Boats when he was shot down and captured in 1940. After escapes from camps including Slalag Luft I & 3 he was transferred to Coldilz in 1942 until the end of the war. Joining the Royal Welsh Regiment in I938 he was captured near St Venant in 1939. After escaping from Eichstedt and because of many other escapes, he spent lime in several prison camps before being moved to Colditz in 1943. where he was invoKcd in numerous escape attempts. After joining the Kings Royal Rifles in 1938 he was wounded in France and captured and after hospitalisalion was sent to Posen. Me subsequently escaped making it to Warsaw and with the help of the Polish resistance was en route to Switzerland when he was captured after 6 months on the run. Me was sent to Colditz in 1942. Escaped in 1943 but was recaptured at the Dutch border and was returned until the end of the war. Joining Colditz Wachkompanie in 1942 as a private first class, he was one of around 150 prison guards that manned (he guardroom, gates, towers etc. After the liberation in 1945 he surrendered and was captured and spent until July 1949 as a Russian PoW, eventually reluming to his home town of Dresden. Originally joining the Territorial Army in 1937 he transferred to No 5 Commando's in 1940. Whilst on a raid on St Nazairs in March 1942 he was captured and taken PoW and after a number of escape attempts was transferred to Colditz in 1943, remaining there until the end of the War.